I am always baffled by articles suggesting ways parents can encourage their children to read more: Designate a family reading period and set a timer. Enroll in library summer reading programs. Have them tell you about what they read. Read the same books you want them to read and then discuss them. Oh, don’t get me wrong. I think encouraging children to read is wonderful. If more people spent more time reading more books, the world would be a better place. Especially for authors and optometrists. 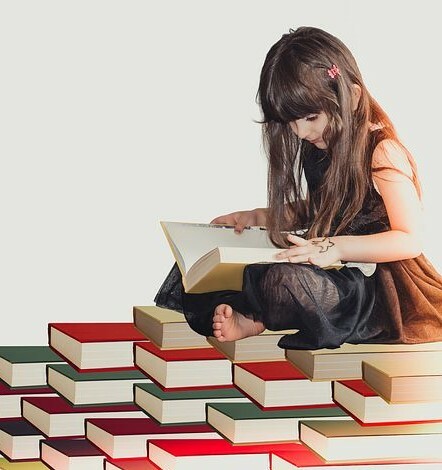 But in my family, the challenge wasn’t to get children to read, it was to get them to stop reading long enough to do other stuff like chores and homework and practicing the piano. It’s not that the Very Minor Celebrity was such a scary guy. True, his self-assured presence and trained actor’s voice, not to mention his advanced age (he had to be almost 30) gave him a sophistication that was more than a little intimidating. But the real reason the poor girl couldn’t eat her peas wasn’t his presence but the reason for his visit. She was one of the contestants hoping to be chosen to represent our school in the Miss South Dakota pageant and potentially have a shot at becoming Miss America 1970. He was one of the judges. 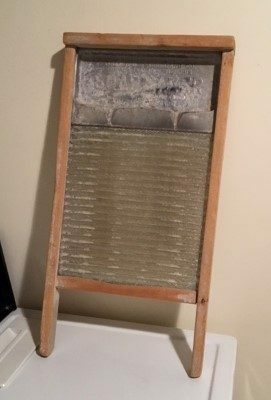 The washboard hanging on the wall of our laundry room is no reproduction, artistically distressed to look pseudo-authentic. It’s just plain old. It’s been used. The wood is unevenly bleached and stained from standing in tubs of hard water laced with harsh soap. At the bottom of the ridged glass surface, the frame is worn away in the middle, no doubt from years of scrubbing dirty overalls. I even know whose hands must have done that scrubbing. Not my grandmother (one of my sisters has her washboard), but my grandmother’s neighbor and close friend. But let’s not wander too far into “olden days” stories about my grandmother scrubbing clothes on a washboard for a family of 12. At least by the time my mother was old enough to notice, in the early 1930’s, washboards may have been still used for extra scrubbing, but the bulk of the laundry was done with a washing machine. First they had one with a wringer that was turned by hand—a perfect chore to assign to kids (in rotation, of course). The next one had an agitator and a wringer powered by a small gasoline engine. You can see one like it in action here. We were traveling, so I almost missed it. Yesterday, January 23, was National Handwriting Day. 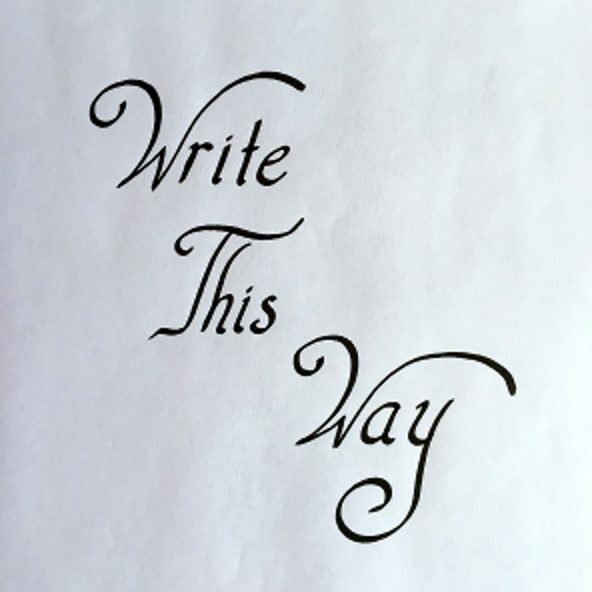 Given the current trend away from teaching cursive writing in schools, it would be easy to assume this is a new observance, started by concerned calligraphers, Palmer Method purists, and letter-writing grandparents who are afraid their grandkids won’t be able to read anything sent to them except the numbers on their birthday checks. Appropriately, then, I wrote the first draft of this post with a pen, on the wide-lined notebook paper that I stock up on every fall during back-to-school sales. I can’t say I did so in honor of John Hancock or National Handwriting Day. Nor as some sort of statement in favor of cursive writing. I just prefer to write that way. 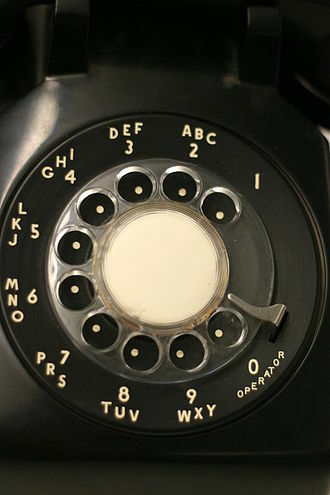 Way, way back in the olden days, when telephones had rotary dials, making a call meant putting one finger (or, for those with thick fingers or manicured nails, the end of a pencil) into the hole by the appropriate number, rotating the dial all the way to the right, letting it spin back to the left, and repeating for each number. Which is why we still often say we “dial” phone numbers, even though touch-tone phones with buttons started replacing rotary phones in the 1960’s. Back when long-distance phone calls were expensive and not to be made thoughtlessly, you could dial “O,” get an operator, and place a person-to-person call. Not just to a given number, but to a specific person at that number: Mr. Jones in the purchasing department, or Uncle Albert, or your mother. Such a call cost more than a talk-to-anyone call you placed yourself, but if the person you asked for wasn’t in, the call wasn’t completed and there was no charge. 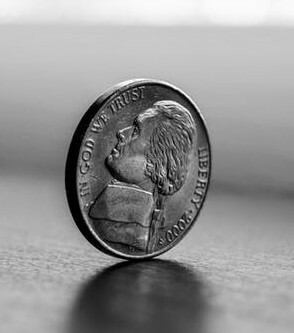 A whole generation of college students found this useful. After a holiday or weekend visit home, placing a person-to-person call to themselves at the home number was a free way to let Mom and Dad know they had arrived safely back at school. Today, the Internet allows us to communicate freely, easily, and almost instantaneously with vast numbers of people all over the world. The very idea of placing a phone call with the help of a human operator—and paying by the minute for it—seems almost as cumbersome and outdated as sending a telegram or writing a letter with a quill pen dipped in ink. But one thing hasn’t changed. Every electronic communication we send out—an email, a text, a tweet, a blog post, a shared photo or video, a comment on social media—every single one is still a person-to-person message. Thousands of people might see or read or share it, but each one is a separate human being responding in an individual way. Even an automated robo-call or bot that targets huge numbers of random recipients originates from some real live person somewhere. And all that spam is received by separate people whose irritation and inconvenience is downright personal. So, on the outgoing side, before you post or text or send any other kind of communication, it might be helpful to stop and consider whether it’s worth sending. I doubt that many of us would go to the trouble and expense of placing an expensive person-to-person long-distance call just to yell at someone or call them an idiot. Maybe it’s not a good idea to do essentially the same thing just because the Internet makes it easy. And on the incoming side, we can take advantage of one very useful feature of the person-to-person call: If you are the one it comes to, you don’t have to accept it. You don’t have to participate in divisive or insulting messages, crude jokes, drama-stirring incitements to indignation, pseudo-sentimental appeals, unsolicited ads, or anything else you don’t want in your life. Every incoming communication comes with a choice to take it in or ignore it. You can read or view it or not, respond to it or not, disconnect from its sender as much as possible, make liberal use of spam filters, and choose not to waste time and energy on junk. No person-to-person message can be completed unless you say yes to it. You don’t have to be “in” to every piece of spam that comes your way. Hollyhocks are weeds. Or so I’ve been told by several “real” gardeners. The kind of gardeners who know the proper temperature for compost, whose tomatoes flourish, and whose gladiolus (gladioluses? gladioli?) win awards at county fairs. The kind of gardener that I definitely am not. Three years ago, I finally planted those seeds, along with some others scavenged with permission from the garden of an old mansion-turned-museum in Trinidad, Colorado. Amazingly, some of them sprouted. Some of them grew. Some of them even thrived. This year, despite drought and heat, they and their descendants have taken over half of one bed in our flower garden and are blooming vigorously. I have to admit that they have spread like, well, weeds. And that with their huge leaves and tall stems they do look a bit, well, weedy. I might even acknowledge that I would be wise to cut some of them back this fall before all those seeds mature. But in the meantime, I can show my grandkids how to make hollyhock dolls the way my sisters and I used to do. Here’s how: You pick a few blossoms that are fully open, plus a matching number of half-open buds or smaller blossoms. You strip the stem off of the buds, along with the green leaves that support the bottom of the flower. (A real gardener, no doubt, would know what those are called.) This reveals a little eye-shaped opening between each partially furled petal. Carefully slide the stem of one of the open flowers into one of those openings as far as it will go. The larger open blossom, upside down, becomes the long, full skirt of a gown. 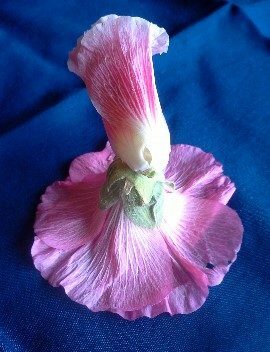 The white bottom part of the half-open bud becomes the doll’s face, adorned with a frilly hat. Okay, maybe the faces are a little rabbity, the hats a bit crooked, and the gowns a trifle uneven. But they’re fun. And, given the generous abundance of hollyhocks, nobody cares that you pick them. 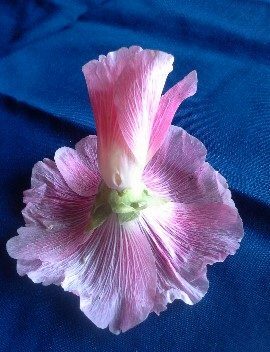 The other day, as we passed on our daily walks, one of my neighbors said, “I just love your hollyhocks. They remind me of my grandmother.” She asked if she could harvest some seeds, which I’ll be happy to share. So it isn’t just me who understands what’s going on here. It doesn’t matter that, to some gardeners, hollyhocks look like weeds. To some of us, they look like memories. • Most of all, being intimidated by Miss A., whose teaching style was impatient and who indelibly taught us to associate running laps with punishment. What’s bringing back those unhappy memories is the fact that I’ve recently joined a gym. It’s not because I’m dreadfully out of shape or unfamiliar with working out. I’ve been exercising quite comfortably at a women’s fitness center for several years, and I even have real muscles to show for it. But that place moved to a less convenient location, and instead of moving with it I switched to a different center much closer to my house. This one is—gulp—a real gym. It has unfamiliar and intimidating machines with enough settings to make me wish for instruction manuals. It has racks of weights, some of which are heavier than I am. It has guys working out there, some of whom have more than enough muscle to lift those weights. The first few times, just walking into the place felt almost as uncomfortable as trotting reluctantly into the high school gym in my ugly uniform. The difference is that now I appreciate the challenge—well, sort of. I know I can learn the routine and the machines, because I’m choosing to. I’m sure it won’t be long till I feel right at home. Especially because the gym manager is a middle-aged woman who, while she is fit and toned and looks great in Spandex, is also friendly, supportive, and more than willing to answer questions. The young muscle builders are casually friendly and so focused on their own workouts that they don’t really care what anyone else is doing. And there are plenty of members, both men and women, who are long past comparing their physical prowess to anyone else’s and just want to stay in some sort of reasonable shape. Pretty much like me, in fact. But the other day, as I finished my workout, I did start to wonder what Miss A. would think if she saw me now. Back then, I had the impression that she didn’t like me—which, given my level of non-enthusiasm for her field, was hardly surprising. My sole experience of detention was from her, a punishment for saying I lost track of how many sit-ups I had done because I was too embarrassed to admit how few I had managed to do. Possibly, had she been a bit more encouraging and a bit less sarcastic toward those of us who were athletically challenged, I might have felt safe enough to tell her the truth. Sorry, Miss A., but in some ways I am still a physical education failure. After all, I never have learned the rules of softball or basketball, and I’m still pretty vague about volleyball. All through adulthood, I’ve never played the first two and very rarely participated in the third. Nor have I ever tried to do gymnastic moves on a balance beam or attempted a flip on a trampoline. I’ve never run laps, either—they are as unappealing to me now as they were in high school. On the other hand, I do walk two to four miles almost every day and work out four times a week. I only weigh five or seven (okay, okay, maybe ten) pounds more than I did in high school. I can jitterbug, waltz, and foxtrot for an entire evening, with the occasional polka thrown in for a little extra cardio workout. I can easily hike up and down small mountains. (Harney Peak, anyone? The view from the top is wonderful.) And perhaps most important, I am able to comfortably lift toddler grandchildren and carry them for moderate distances. I do, however, draw the line at combining grandkid-toting and mountains. I don’t know what you’d think of all that, Miss A. Even better, I don’t care. It’s a late spring Saturday afternoon on a small college campus. A pretty freshman girl in a bikini—a modest one, sewed by herself from a Simplicity pattern—is sunbathing on the lawn by her dorm. Along the nearby sidewalk strides the football coach, towing two high-school seniors, potential players he is recruiting. The coach veers off the sidewalk, with the boys trailing along like baby ducks behind their mother, and approaches the girl. She knows the coach, partly because she took his biology class last semester—yes, the college is that small—and partly because she has a campus job in the admissions office. Still, she’s surprised when he comes over to ask her a question related to admissions. Especially since she knows perfectly well he knows the answer as well as she does. She’s also somewhat annoyed. It’s Saturday. She isn’t working in the admissions office; she’s reading, and the coach has just interrupted her for no apparent reason. Plus she feels uncomfortable lying there on her towel in her bikini being loomed over by three tall guys. But the girl doesn’t know what else to do, so she answers the coach’s question. He introduces the boys. After a short interval of awkward conversation, the coach and his prospects resume their campus tour. The girl briefly wonders what that was all about, gives a mental shrug, and goes back to her book. The girl was about 35 before it dawned on her what that had been all about. Of course, the coach had a few problems of his own with that equation. He thought the “flirtation” part was a constant and didn’t realize it was actually a variable. Or maybe they went someplace where the girls were friendlier. Sorry, Coach. Except, looking back now, I’m not really sorry. It’s been decades since I sunbathed, and I haven’t worn even a modest bikini since I was blessed with children and stretch marks. But if I did happen to be lolling in the sun these days, I still wouldn’t appreciate being interrupted and loomed over. Especially not by guys assuming any female in a bikini would find them more interesting than a good book.